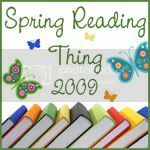 I so enjoyed being a part of the Fall Into Reading Challenge over at Callapidder Days so it is with much joy and gladness that I am participating in her Spring Reading Challenge. My personal challenge is simply stated: To read every single review copy sitting on my shelf and clean the shelf off. When you see the list of books I have to review you might have a better idea of what I don't know whether or not to laugh or cry. Think that's enough? I'm thinking probably so - even though I haven't mentioned the other dozen or so titles that are sitting on my shelves staring at me! But when I'm done it'll feel oh so good! So that's my plan. Succeed or fail, it's My Great Attempt. What a great opportunity! Thanks, Katrina, for hosting and motivating us all! I look forward to visiting around to see what has made its way into your Spring Challenge. My goodness, you have a big list with a ton of variety! I'll be looking forward to seeing your reviews as you make your way through these! I can't wait to see what you think of The Man Who Created Sherlock Holmes...I keep going back and forth on that one. I am going to add The Jew Store to my list of books to check out. Great list and best of luck. Wow! That is an impressive list...and I'm embarrassed to say that I haven't heard of many of them (let alone read them)! I have a feeling that my Amazon wish list is going to grow significantly the further into this challenge I get! Great list - I'm interested in hearing about them. Great goal to clear off your review shelf! Wow, those are some heavy duty titles! The one behind GWTW sounds intriguing. Wow! You really all pulling out the variety for 5M4B and I appreciate that. Some look really interesting to me. Wow! Good luck with your Great Attempt. It sounds like the ~best~ kind of Spring Cleaning to me! And I'm not surprised to see wonderful variety in your list. Looking forward to all your reviews, particularly the Sherlock Holmes book and Octavian Nothing. Just popping back in to let you know I have an award for you on my blog. Very intriguing titles, looking forward to your thoughts. I can soooo identify with you, Carrie! I'm addicted to reading as well. On Friday night I read an entire Dean Koontz book at one sitting. I'll have to stop by your blog again when this party is over. Stop by and visit mine when you can! I finished Breach of Trust this AM, I can not wait to hear what you thought! Looks like you have some interesting titles/subjects here. I look forward to your reviews!